It is human nature to compare ourselves with others. If you wish to progress with any goal or skill, you have to know what potential there is for that goal or skill. Can someone my age accomplish this particular goal? Is that a short term or long term goal? This is where the Clarinet Leadership Scale comes into place. It gives you an idea of where you are and that helps you figure out where you need to go and how to get there. HOWEVER, IT IS MOST IMPORTANT THAT YOU LOVE TO PLAY MUSIC AND WISH TO DO THAT BETTER. If you focus on making GREAT music the best you can, you will have a much healthier and happier music career than those to go to “win” a competition, “win” an audition or “get the most points.” Focusing on making the best music will help you win without focusing on winning. How much “heart” did they express? How much “feeling” did their performance have? Was it exciting to listen to them or did the performance come off “perfect” and boring? So, make great music and your musical leadership will follow. Now, let’s talk about your leadership. Basically, it happens like this in a nutshell. Who do you need to learn from? Who can you help? What are you doing to get the CLARINET out there to the public? 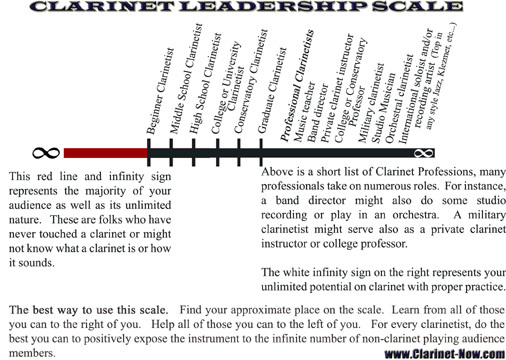 On this Clarinet Leadership Scale, it is explained that you find where you are: learn from all of those on your right and help all of those on the left. The one addition is to really try to expose clarinet those who know very little or none about the clarinet. Let’s say you are a high school clarinetist in eleventh grade. You’ve just tried out for your top concert band in high school and made FIRST CHAIR. You even beat out some of the seniors. Clearly, your skills were tested and you WON the top seat, top dog, big fish, etc… Now, you show up to band and let’s say you have a section of twenty clarinetists. Believe it or not, they are looking up to your clarinet leadership. They are looking to you to play your parts well and hopefully help them out if they need it. So, this sounds like a pretty big burden, right? Well, again, it is your duty to help all of those you can. One thing you can do is to run a clarinet sectional. So, this means you are not only first chair, but a Clarinet Section Leader. You will find much more information about the Musical Leadership of the Clarinet Section Leader by clicking here. 1. Practice. Practicing and self-discipline will help you win at the clarinet. It is awesome that SKILL is the first step to becoming a Clarinet Leader. 2. Focus on making GREAT MUSIC. Putting your heart into the music and having an idea of what the music should say will give your playing depth and meaning. 3. Now, apply number one and number two to your Clarinet Leadership. If you can help guide others to understand number one and two, you are a clarinet leader. If you can apply the same practice skills and/or routines and/or problem solving techniques to clarinet sectionals or clarinet chamber music ensemble rehearsals, you will lead your clarinetists to a better musical experience. Common mistakes of clarinet leadership. 1. Thinking you are better than everyone else and showing it. 2. Wanting to lead without the practical knowledge or skill. 3. Once you are in the position, not keeping your skills up to retain the position. 4. With pitch, assuming you are right and everyone else is wrong. 5. Remember, you can learn from your clarinetists - whether it is how to teach something about clarinet or finding a great tip they picked up in their experience. It is awesome that SKILL is the first step to becoming a Clarinet Leader. But, many people get the skill but do not have leadership skills or know how to build or improve them. Read through the Clarinet Sectional and Clarinet Section Leader pages to help improve these attributes in yourself. Now, let’s think of the beginning clarinetists in the world. Perhaps they just learned how to put the clarinet together for the first time in their life. This is the very beginning of their “clarinet journey.” How will they fare? Will they last a week, month, year, through middle school, high school, college (conservatory) and/or become a professional? In your experience, what can you tell them to help them avoid some of the mistakes or bad habits your developed and had to overcome? American composer Charles Ives wrote one of the greatest pieces of music of all time. It’s called The Unanswered Question. In this composition, a string orchestra starts with a beautiful hymn that flows smoothly, eerily and beautifully along. A lone trumpet then poses a question. The strings continue unscathed and uninterested in the question. A quartet of flutes (or various woodwinds) then proceeds to answer this question with a snooty, irritated overtone. The strings continue their hymn uninterested in the question or answer. The trumpet continues to ask the question and the flutes continue to answer becoming more and more irritated. Finally, the trumpet asks one more time and the strings fade out to nothing. The question goes unanswered. Who are the groups? Where are you in this scenario? Are you the questioner, answerer or druid? The strings represent the druids who see, hear and care about nothing. The flutes represent the so-called experts attempting to answer the question. They answer and answer and finally give up. As a musician, you will know and fit into all three groups. If you honestly think about it, we all fit into every group. A rocket scientist might know nothing about the cotton growing or fabric industry. You will ask questions, you will answer questions, you will not care about many subjects. Please consider the importance of the druids and the clarinet. Who is really exposed to the clarinet? Do they really care about clarinet? How will you expose them to the clarinet? They probably do not care, but again, it is OUR JOB to at least expose them to the clarinet. Will clarinet ever supersede the rock guitar? Probably not. However, how many people in the world have heard a beautiful melody spun out by a clarinetist or a whopping great clarinet jazz lick? They might just like it. We want them to hear it on the radio, Ipod or TV, but WE really want them to hear it LIVE. We are depending on your Clarinet Leadership to help this charge.